President Obama on Wednesday announced that he would sidestep congressional hearings and use a recess appointment to install Dr. Donald Berwick as the head of the Centers for Medicare and Medicaid Services. The job — running the federal health insurance programs for the low-income and elderly — has gained particular prominence this year as the new health care reform law begins to go into effect. Under the new law, Medicaid will expand to cover everyone who makes up to 133 percent of the poverty level (up to 16 million more people). Meanwhile, the reform act relies on major changes to the Medicare to save hundreds of billions of dollars over the next decades. 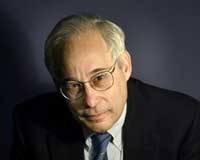 Berwick, a pediatrician and a professor at Harvard Medical School, is an expert in health care quality. He runs the Institute for Health Care Improvement, a not-for-profit organization that works to improve patient care. In 2006, the NewsHour profiled the Institute’s 100,000 lives campaign to reduce medical errors in hospitals. That program later morphed into the 5 million lives campaign. The NewsHour also talked to Berwick about using evidence-based medicine to improve health care, and about moving to an electronic health care record-keeping system in the U.S.
Kaiser Health News has pulled together a resource guide to Berwick’s career. Despite his strong reputation in the health policy community, Berwick’s nomination had become yet another flashpoint in the debate over health care reform. Opponents seized on comments he had made over the years about rationing health care and the fact that he had expressed admiration for some aspects of the U.K.’s national health care system. Given the difficult political path ahead, the president decided to appoint Berwick via a recess appointment while Congress was not in session. The recess appointment means that Berwick can start his job without Congressional approval, but his term will expire at the end of the next session of Congress, in late 2011. Congress moves slowly during the summer, and there are only a few months left in this Congress. Whatever happens in November, it’s very likely that the next Congress is going to be less hospitable than this one. Given the immediacy of the task, you can see why the president would want a full bench. Insofar as Berwick is a radical, he’s a radical in favor of a patient-centered health-care system — a position that has traditionally been associated with conservatives, not liberals […]None of this is to suggest that Berwick is a Reaganite. But there is much in his vision that conservatives will find appealing. The reality of the situation is that Barack Obama just put an advocate for a patient-centered health-care system in charge of much of health-care reform. Conservatives have scored a big win here, even if they don’t know it yet.